My love for parfaits is getting a bit out of hand. I have a summery recipe for AIP Key Lime Pie Parfaits, and a Chocolate Blueberry Pots de Creme (dairy free), and yet here I am with a fall parfait recipe. My motivation behind sharing healthy, yet still delicious recipes? It makes it easier to stick healthy lifestyle choices! When I first started out on the Autoimmune Protocol, I identified 5 ways to rock the AIP transition. However, it took me all this time to realize that I missed a pretty crucial tool to have in your arsenal when planning to rock a successful transition into the diet – a plethora of healing, AIP friendly, DELICIOUS dessert recipes. Up until that time, every single dessert recipe I found as basically just a vegetable disguised as a dessert. Which meant that on top of all the other foods I was giving up, I was also missing out on desserts that actually tasted good. Instead of moping around, I got to work and started creating! This recipe has more sugar than you might typically see on a healing diet like the Autoimmune Protocol (AIP), but I personally found that to be necessary in order to actually stick to the diet – especially during the holidays. If I’m sharing a dessert with my family, I want it to be full of ingredients that make me feel great and flavor that tastes great, too! I’m pleased to share that this one satisfies both. 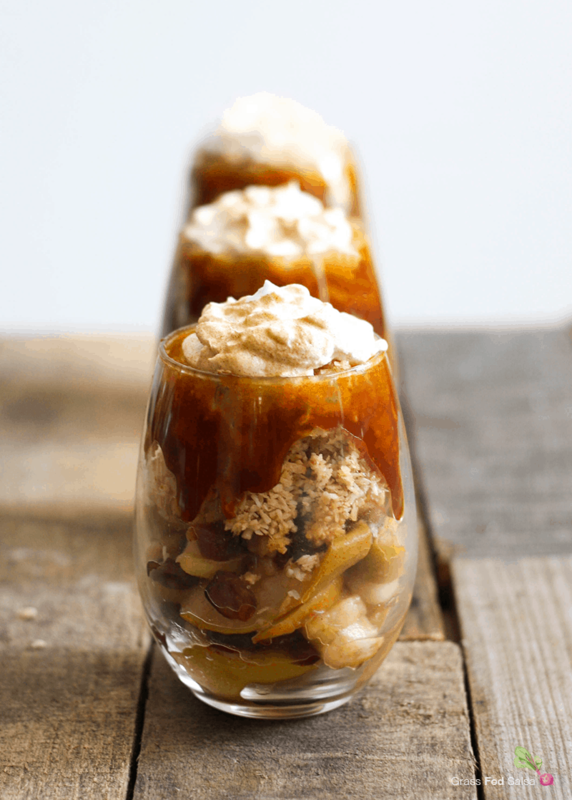 Which brings me to these Salted Caramel Apple Parfaits. 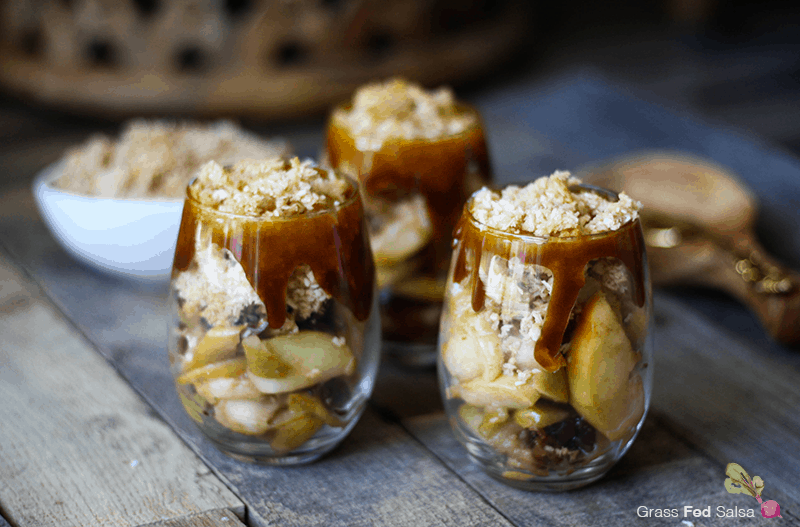 With the fall and winter holiday season coming up, these AIP-friendly Salted Caramel Apple Parfaits are sure to be included on my holiday menu (and the occasional weekly meal plan as well). They’re so simple to make, they travel well, and they aren’t starch and sugar bombs. 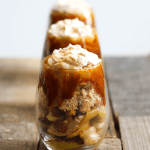 Need other healthy Thanksgiving recipes? Here are a few you’ll love! Ready for a warm and comforting fall treat? 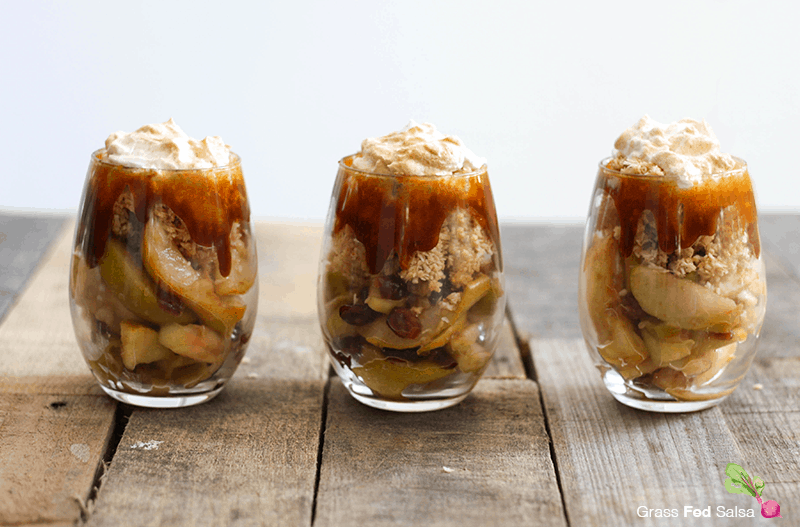 These Autoimmune Paleo (AIP) friendly Caramel Apple Parfaits are just what you’re looking for. These parfaits are nut free, gluten free, and dairy free, and full of fall flavor. Store in a mason jar for a pre-portioned, easy to store treat. Peel and slice your apples and/or pears. Melt coconut oil in a saute pan and add sliced fruit and cinnamon. Stir occasionally until the fruit is soft (about 5-10 minutes). Heat maple syrup over medium low heat for about 5 minutes, stirring constantly. Timing should start with the syrup is bubbling. Be sure to stir constantly, and don’t overheat or it will burn. Remove from heat and add remaining ingredients. Stir to combine. Add pan back to heat for about 10 minutes, stirring constantly. The timer should start when the mixture starts to bubble again. Don’t bring to a boil, or it will over harden. The mixture should thicken, but won’t solidify. Set aside in a jar to cool. Preheat oven to 300 degrees. Line a cookie sheet with parchment paper. Combine ingredients in a bowl until the coconut is well covered with syrup and cinnamon. Spread the mixture evenly across cookie sheet, and bake until it turns golden brown. The coconut will crisp as it cools. Drizzle Salted Caramel Sauce around the top of six small glasses. Allow caramel to drizzle down the sides of each glass. Alternate layering Coconut Crumble and Apple Filling in the jars, stopping about 1” from the top. Top each parfait with a small scoop of Coconut Milk Whipped Cream and sprinkle with ground cinnamon. I made that recipe but as soon as I put the caramel in a glass for assembling, it became hard and stuck at the bottom. Any tips?